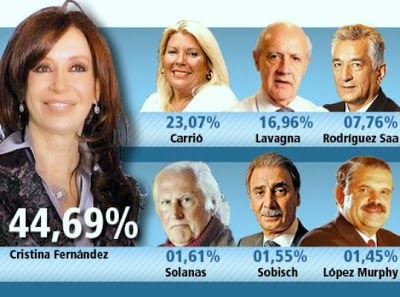 With 96,58% of the total votes counted we have the following official results: Cristina 44.92%, Carrió un 22.95%, Lavagna 16.88%, Rodriguez Saá un 7.71%, Solanas 1.60%, Sobisch 1.56%, Lopez Murphy 1.45%, Ripoll 0.76%, Pitrola 0.62%, Montes 0.52%, Luis Ammann 0.41%, Raul Castells 0.30%, Gustavo Breide Obeid 0.25% y Juan Mussa 0.07%.To see the full results please see this article. These are the results taken from 96,58% of the total votes. These official provisional results were announced by the National Electoral Office from the Center of Electoral Results in the Palacio de Correos y Telecomunicaciones.